Richard makes his Resonus debut with this album of solo concert works by major film composers. Composing Without the Picture features works by John Williams, Ennio Morricone, Ernst Toch and Miklós Rózsa together with five world premiere recordings of works by Christopher Gunning (Variations On A Slavic Theme), Dario Marianelli (I Think I Do Remember Him), Alex Heffes (Theme from ‘Touching The Void’), Fernando Velázquez (Tarde, una tarde de mayo) and Benjamin Wallfisch (Prelude). Four of these works were written for Richard and this release. "British cellist Richard Harwood has created a unique album of film music that works stunningly well without the pictures themselves....This extraordinary recital is rounded off by five world premieres....Harwood plays them all with supreme dedication and musical insight, captured in exemplary sound of stunning realism." 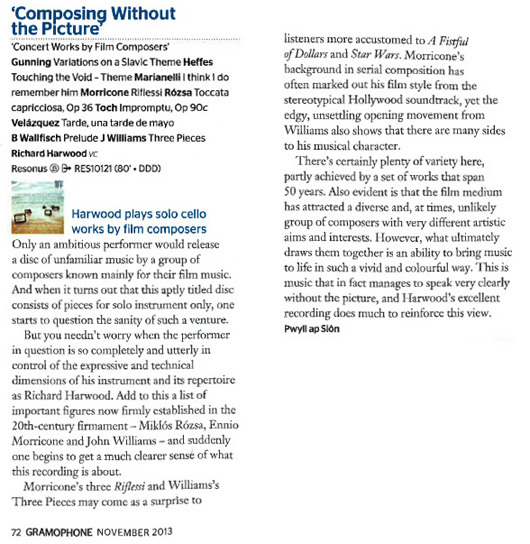 "Throughout a generous programme, warmly captured by the Resonus recording team, Harwood's resonant cello ranges widely from the rigorous old-school workouts of Ernst Toch and Miklós Rózsa to a descriptive contribution from John Williams (with its plucked and picked passages imitating a banjo), to the restrained post-modernism of some of the performer's contemporaries, who provide him with no fewer than five world premiere recordings." 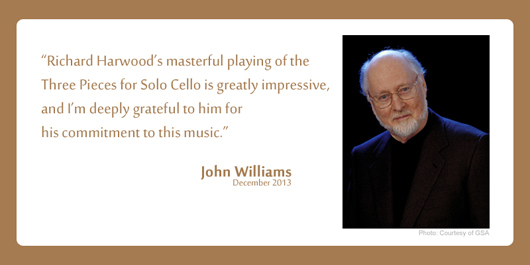 "Music for solo cello by film composers: an engaging idea delivered by Harwood with fire." "Overall this is an excellent album of solo concert music with great performances of all the works in question." "This fascinating disc is a compilation of concert music written by some well known film composers. But what makes it so striking is that Richard Harwood has assembled a group of pieces written for solo cello, not a genre you would associate with composers like Ennio Morricone and Miklos Rosza....Harwood's performances are exemplary in all respects." "Harwood’s album, released by Resonus Classics, is available digitally only and has genuine appeal. It’s a fascinating window into non-film music by film composers and the performance by the in-demand cellist is at times truly virtuosic and reveals a deep appreciation of the material."